A group of scientists claim they've discovered a subatomic particle that closely matches the description of the fabled Higgs boson. NBC's Mara Schiavocampo reports. Scientists say they've discovered a type of particle that's never been seen before — a particle that mostly matches the description of the fabled Higgs boson. "This is a very, very preliminary result, but we think it's very strong," said Joe Incandela, spokesperson for the CMS experiment at CERN's Large Hadron Collider. Hundreds thronged to an auditorium at the CERN particle-physics center near Geneva to hear the latest from the LHC, and thousands more watched the proceedings on computers and big screens around the world. The timing of today's briefings was most convenient for Europeans as well as researchers attending the International Conference on High-Energy Physics in Australia, but video-viewing parties were organized as well in the middle of the night for scientists and science fans in the United States. "As a layman, I would now say, I think we have it," CERN Director General Rolf Heuer told the audience in the auditorium. "Do you agree?" His question sparked wild applause. The advance buzz suggested that researchers would report observations of a previously unknown particle that fit the characteristics of the Higgs boson. Last December, the teams behind the LHC's ATLAS and CMS experiments reported seeing "tantalizing hints" of the Higgs, and since then, the experiments have doubled the amount of data collected from hundreds of trillions of proton collisions at higher energies. The results presented by Incandela were in line with expectations. "We have observed a new boson," he reported. Incandela set the mass level of the new particle at 125.3 billion electron volts, or 125.3 GeV, plus or minus 0.6 GeV. CMS spokesperson Joe Incandela discusses the new particle in a CERN video. Results from the ATLAS experiment also pointed to "clear signs of a new particle" in the range of 126.5 GeV, spokesperson Fabiola Gianotti said in a statement. The uncertainty factors were wide enough for one particle to produce both of those reported values. CMS and ATLAS serve as backups for each other, and the fact that the same phenomenon was observed at both detectors added to the solidity of the claims. Physicists said more data would have to be collected to confirm that the particle was truly the Higgs. "To say you've discovered the Higgs ... it's a complicated story," CERN theoretical physicist John Ellis said in a video prepared in advance of today's briefings. "It's one thing to see evidence of a new particle, but you have to check whether it has the right properties. And to check whether it has the right properties will actually take quite a bit of extra work." After today's announcement, Heuer alluded to the job ahead. "We have to find out which kind of Higgs boson this is. ... We have discovered a boson, and now we have to determine what kind of boson it is," he told reporters. Later, he said "we can call it a Higgs boson, but we cannot call it the Higgs boson." Getting the full picture would take time. "Ask me in three, four years," after the LHC reaches full power, Heuer said. Fermilab physicist Don Lincoln, who is a member of the CMS research team, agreed that a little caution was in order. "It is definitely a boson, and it looks and smells like the Higgs. But until we do all the senses ... we won't know for sure," he told me. 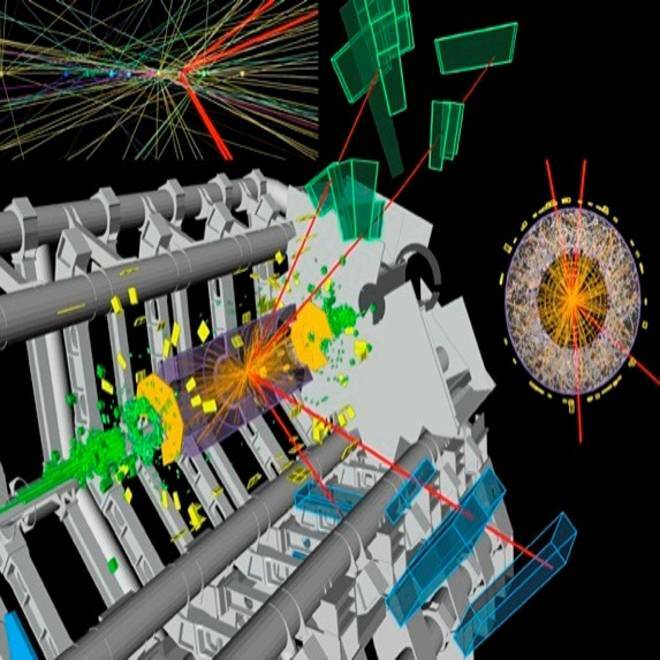 A computer graphic shows a candidate Higgs boson decay in the Large Hadron Collider's ATLAS detector, resulting in four muons. The event was recorded on June 10. Identifying and studying the Higgs boson is the main objective of the $10 billion LHC project. It was the only fundamental subatomic particle predicted by the current theory on the subatomic structure of the cosmos, known as the Standard Model, which had yet to be found. It was hypothesized back in the 1960s, by British physicist Peter Higgs and others, as part of a mechanism to explain why some subatomic particles have mass while others don't. "If that [Higgs boson] would not exist, then you would not exist," Heuer said. Heuer called the discovery "the last missing cornerstone" of the Standard Model, but other physicists said there was still a chance that the newfound boson wouldn't mesh with the Standard Model. "If the new particle is determined to be the Higgs, attention will turn to a new set of important questions," University of California Irvine physicist Andy Lankford, the deputy spokesperson for the ATLAS experiment, said in a statement. "Is this a Standard Model Higgs, or is it a variant that indicates new physics and other new particles?" In that scenario, studying the Higgs could open the way for explorations of the weirder corners of physics, such as the idea that our universe has six or seven extra dimensions, or the claim that there should be an unseen supersymmetric partner for every one of the subatomic particles that have been detected, or the nature of the stuff that mysterious dark matter is made of. In a CERN Bulletin interview, theoretical physicist Ignatios Antoniadis said the discovery could rule out some of the options for theories on the nature of the universe: "Because of its low mass, such a Higgs boson would allow us to rule out theories known as 'Technicolor' and some of the theoretical models used in supersymmetry. However, other supersymmetric-or-not scenarios could still apply, as well as extradimensional theories." British physicist Peter Higgs accepts a round of applause during the CERN seminar at which researchers announced the discovery of a particle with the characteristics he predicted. The discovery also could send Peter Higgs, who is still active in the field at the age of 83, to the top of the line for a Nobel Prize in physics. Higgs, a professor emeritus at the University of Edinburgh, and several other physicists who were involved in formulating the theory attended today's CERN briefing. After the announcement, Higgs offered his congratulations to everyone involved in the LHC experiments. "To me, it's really an incredible thing that it's happened in my lifetime," he said before choking up with emotion. To claim a formal discovery, the results from the LHC had to reach a confidence level of 5 sigma, which means there'd be just one chance in 3 million that the findings are a statistical fluke. Earlier this week, researchers at Fermilab in Illinois shared what they said were their final results from the Tevatron collider, which has been eclipsed by the LHC and was shut down last year. The results of their Higgs quest came up to a level of only 2.5 sigma — not enough to count as a true discovery. Today, Incandela announced that the results from the CMS detector in one of the expected decay modes for the Higgs boson had a "combined significance of 5 standard deviations." Word of that measurement was greeted with applause in the CERN auditorium. "It's nice to be at 5," Incandela said. Other results from CMS, however, fell just short of the 5-sigma standard — and in at least one decay mode, the expected signs of the Higgs were not present at all. That could be just a fluke in the data, but Incandela said the analysis would continue with more readings. When all the results were combined, the confidence level for CMS was set at 4.9 sigma, he said. Gianotti, meanwhile, said the combined results from the ATLAS experiment reached 5 sigma, signaling a discovery. That revelation, too, drew applause. In at least one of the decay modes, the readings from ATLAS were much higher that what would be expected for the Standard Model Higgs — but it's too early to tell whether that is merely a statistical anomaly or the sign of an unexpected twist that theorists will have to wrestle with. "This is just the beginning," Gianotti said. "There is more to come." In a news release, CERN said the results would be published in a scientific journal around the end of the month, and more data would lead to firmer conclusions by the end of the year. Physicist Stephen Hawking, in an interview with the BBC's Pallab Ghosh: "The results at Fermilab in America, and CERN in Switzerland, strongly suggest that we have found the Higgs particle — the particle that gives mass to other particles. If the decay and other interactions of this particle are as we expect, that will be strong evidence for the so-called Standard Model of particle physics, the theory that explains all our experiments so far. This is an important result, and should earn Peter Higgs the Nobel Prize. But it is a pity, in a way, because the great advances in physics have come from experiments that gave results we didn't expect. For this reason, I had a bet with Gordon Kane of Michigan University that the Higgs particle wouldn't be found. It seems I have just lost $100." CERN research director Sergio Bertolucci: "It’s hard not to get excited by these results. We stated last year that in 2012 we would either find a new Higgs-like particle or exclude the existence of the Standard Model Higgs. With all the necessary caution, it looks to me that we are at a branching point: the observation of this new particle indicates the path for the future towards a more detailed understanding of what we’re seeing in the data." Energy Secretary Steven Chu:"I congratulate the thousands of scientists around the globe for their outstanding work in searching for the Higgs boson. Today's announcement on the latest results of this search shows the benefits of sustained investments in basic science by governments around the world. Scientists have been looking for the Higgs particle for more than two decades; these results help validate the Standard Model used by scientists to explain the nature of matter." Nigel Lockyer, director of Canada's TRIUMF particle physics lab: "With ATLAS and the LHC, we set sail in the direction toward what we thought was the land of the Higgs. Last December, we saw a smudge on the horizon and knew we could be getting close to land. With these latest results, we've seen the shoreline! We know we’ll make it to dry land, but the ship is not in to shore just yet." Peter Knight, president of the Institute of Physics: "This is the physics version of the discovery of DNA. It sets the course for a brand new adventure in our efforts to understand the fabric of our universe. ... Akin to a moon mission, one of the most remarkable things about the hunt for the Higgs is how the effort has caught the public imagination. Not since the Apollo missions 40 years ago has there been such a sense of popular excitement around scientific discovery. Long may this continue to inspire the next generation of scientists." Can physicists crack the big puzzle? ViXra.org: Physicist Philip Gibbs blogs about boson buzz. Not Even Wrong: Columbia physicist Peter Woit's blog. Resonaances: Adam Falkowski counts down to H-Hour. Cosmic Variance: Sean Carroll and company weigh in. Quantum Diaries: Aidan Randle-Conde tracks Higgs hunt. A Quantum Diaries Survivor: Tommaso Dorigo on the case. Of Particular Significance: Reality check from Matt Strassler. The Guardian: Live-blogging the CERN announcement. Last updated 9 p.m. ET July 4.